North Atlantic Books, 9781623170349, 320pp. “I don't remember being born. I was a very ugly child. My appearance has not improved so I guess it was a lucky break when he was attracted by my youthfulness.” So begins the wrenching diary of Minnie Goetze, a fifteen-year-old girl longing for love and acceptance and struggling with her own precocious sexuality. After losing her virginity to her mother's boyfriend, Minnie pursues a string of sexual encounters (with both boys and girls) while experimenting with drugs and developing her talents as an artist. Unsupervised and unguided by her aloof and narcissistic mother, Minnie plunges into a defenseless, yet fearless adolescence. While set in the libertine atmosphere of 1970s San Francisco, Minnie's journey to understand herself and her world is universal: this is the story of a young woman troubled by the discontinuity between what she thinks and feels and what she observes in those around her. 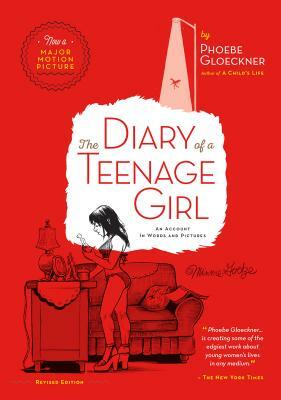 Acclaimed cartoonist and author Phoebe Gloeckner serves up a deft blend of visual and verbal narrative in her complex presentation of a pivotal year in a girl's life, recounted in diary pages and illustrations, with full narrative sequences in comics form. The Diary of a Teenage Girl offers a searing comment on adult society as seen though the eyes of a young woman on the verge of joining it. This edition has been updated by the author with an introduction reflecting on the book's critical reception and value as diary or novel, historical document or work of art. Also included in this revised edition are supplementary photographs and illustrations from the author's childhood, including some of her own diary entries.